(still) cleaning off the painting desk! 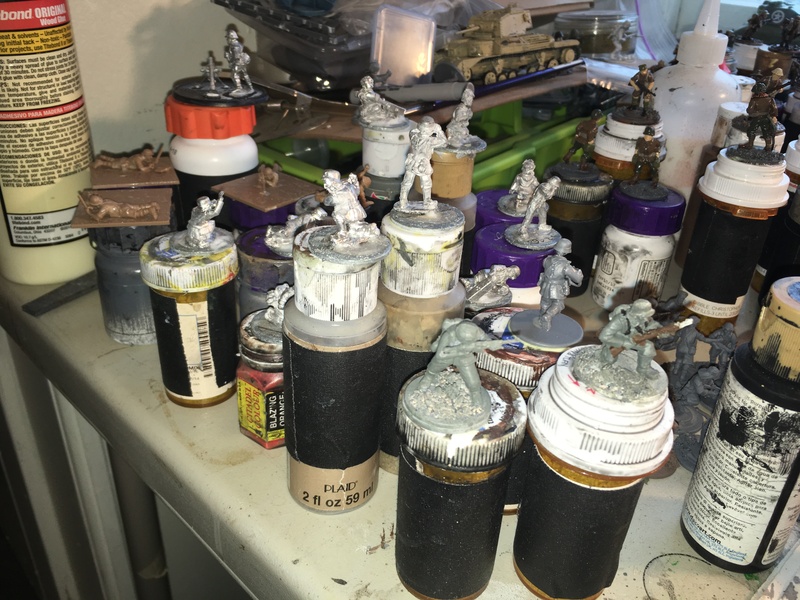 This past week I’ve managed to get a bunch more stuff that has been living on the painting desk for months finished and made progress on some more. I have to move the table in a week so I’m really trying to finish a lot. 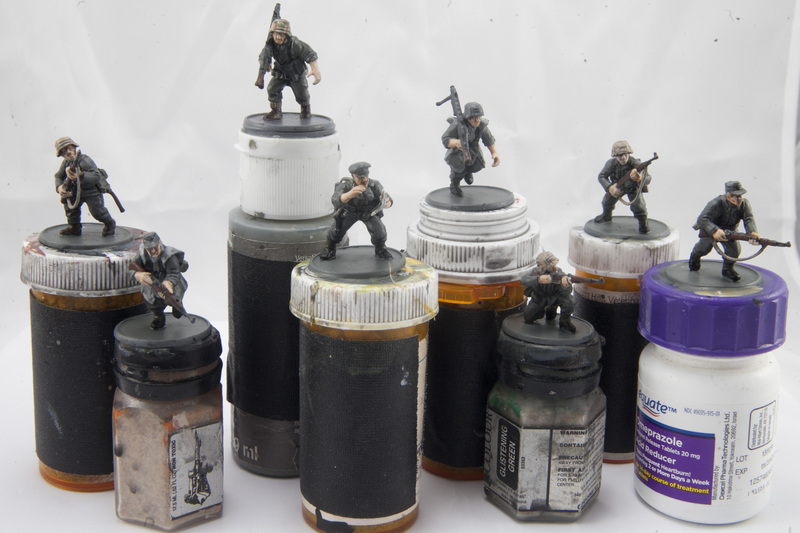 I’m also working on my friend Murph’s Panzer Grenadier army at the same time so I’ve been adding in some of those to the work flow. 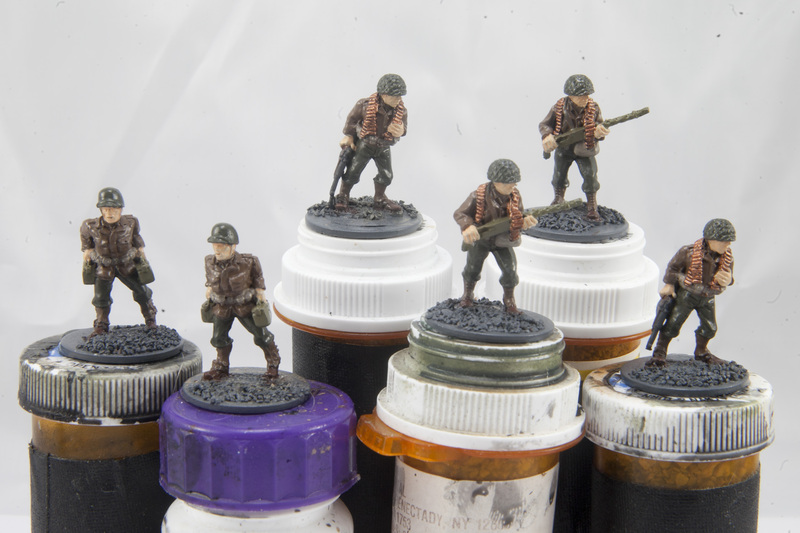 I also had three riflemen from Warlord’s late war German’s and a Fallschirmjager officer from Black Tree Design sitting around with just a grey base coat for at least six months. I am increasingly displeased with the rifles in this generation of Warlord’s plastics. They are thin and break WAY too easily. 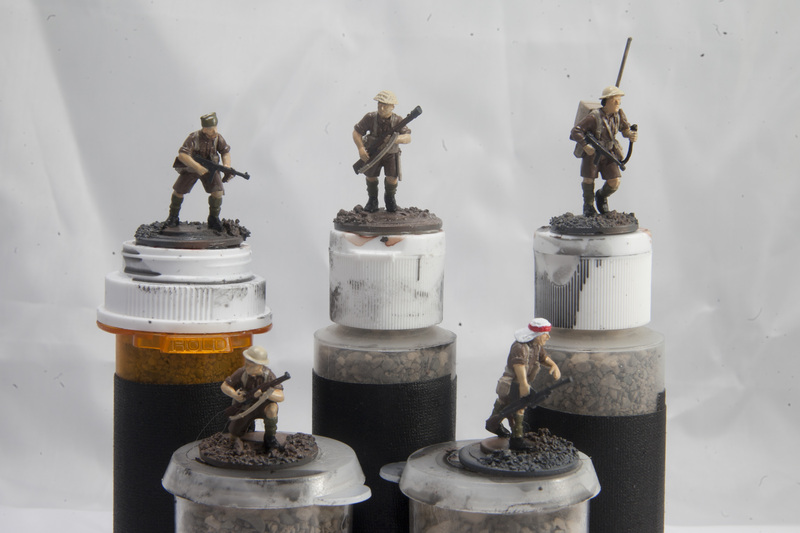 I actually have a pile of soldiers who’s rifles broke while I was painting them. I actually bought metal rifles from The Assault Group to start replacing the broken plastic ones and any new figures I put together will have them. They scale very well and fit into the arms almost perfectly. The newer generation of Warlord’s plastics, the ones with the weapons molded into arms, are fine. They are a little beefier and will actually bend before breaking. The German blitzkrieg, Fallschirmjager and Panzer Grenadiers and the American Airborne troops are all the newest generation. 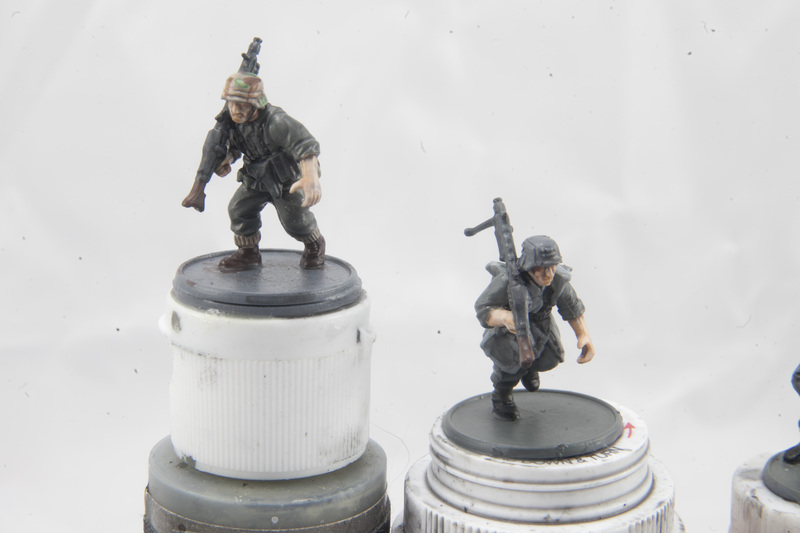 My friend’s Panzer Grenadiers: An officers/spotter, two machine gunners (to make up for the two extra loaders I finished last time!) 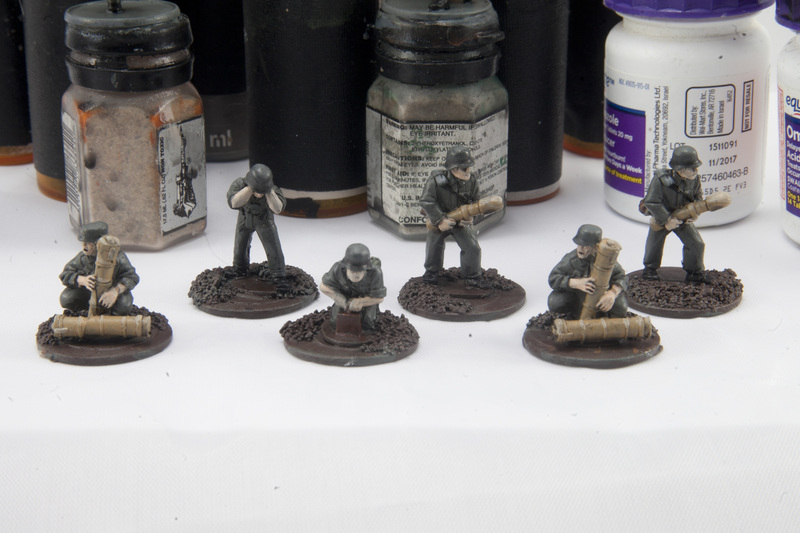 and 5 riflemen (Bolt Action doesn’t differentiate from the Kar 98 and the Gehwer 43 so I’ve made them randomly. Next up: A small group of Americans! 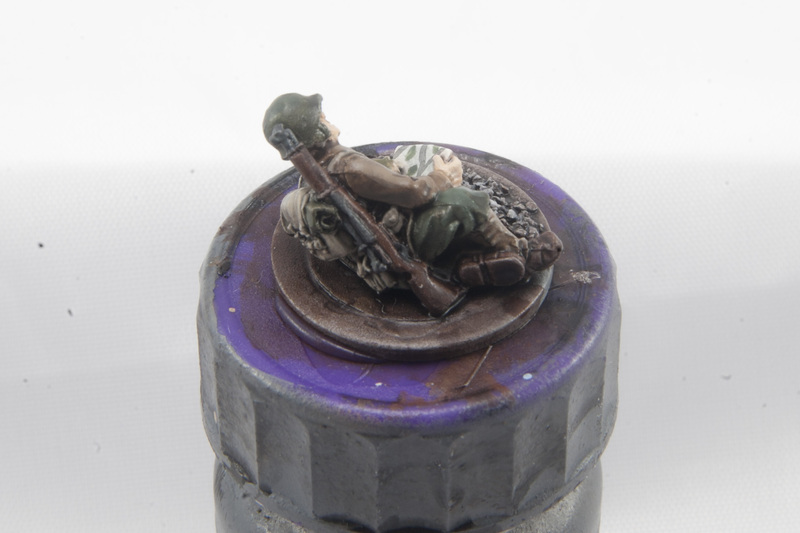 I had a .30 cal machine gun that was only primed and eventually got embarrassed enough to take it out of the case and start painting it. Six months later it’s finished! 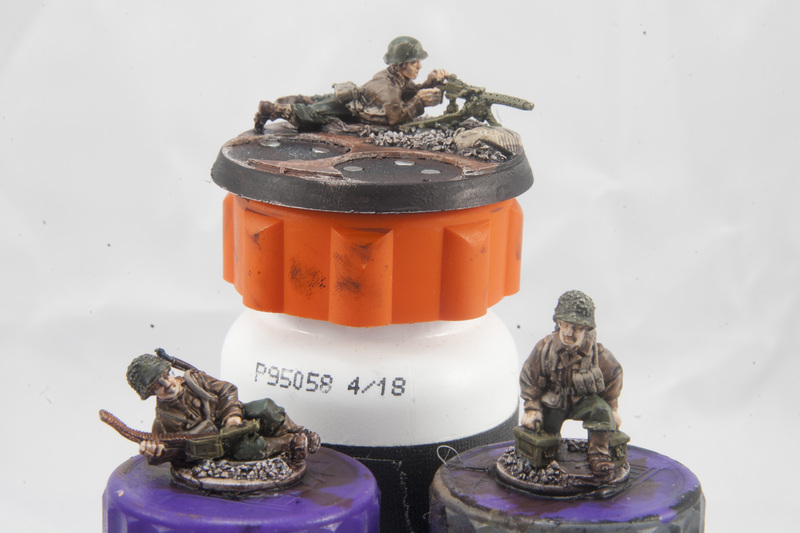 I also made a number of ammo bearers from a combo of the Blitzkrieg Germans and American plastics. Bolt Action uses 3 man machinegun teams but Chain of Command has 4-5 man teams depending on the nation. I got tired of having to make a team up of 3 machine gun guys and a couple of rifle guys and decided to put these guys together so they look better when grouped up. 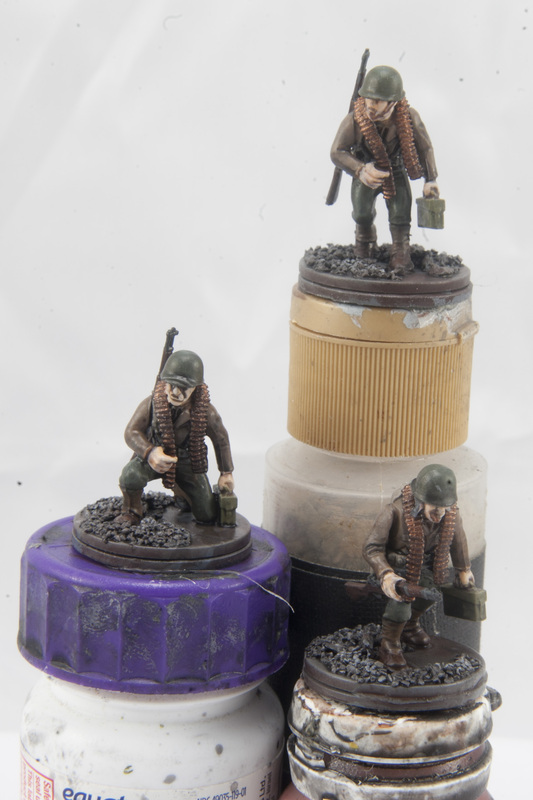 And two men from the Warlord observer pack. 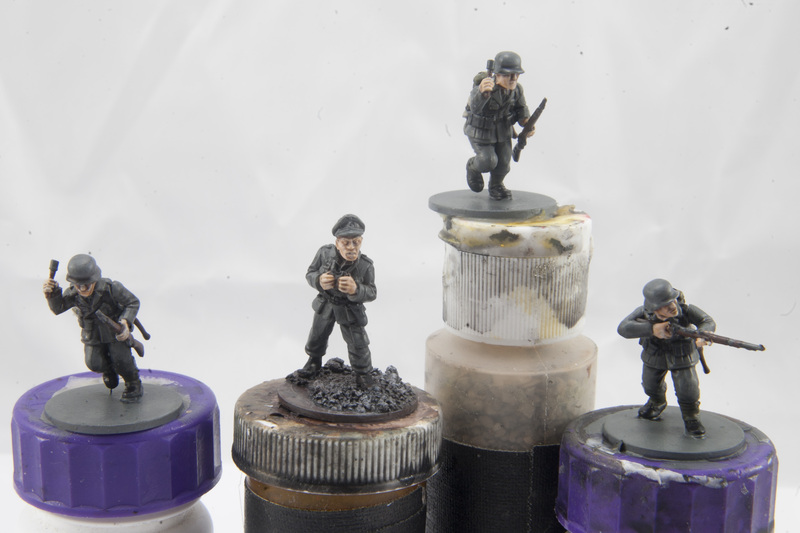 I already painted the third guy, who is kneeling with a radio up to his face. I liked how other people have been painting little maps on these types of guy and decided to give it a try. The photo is a little washed out but there are green and brown spots there and a couple of black lines for a road. 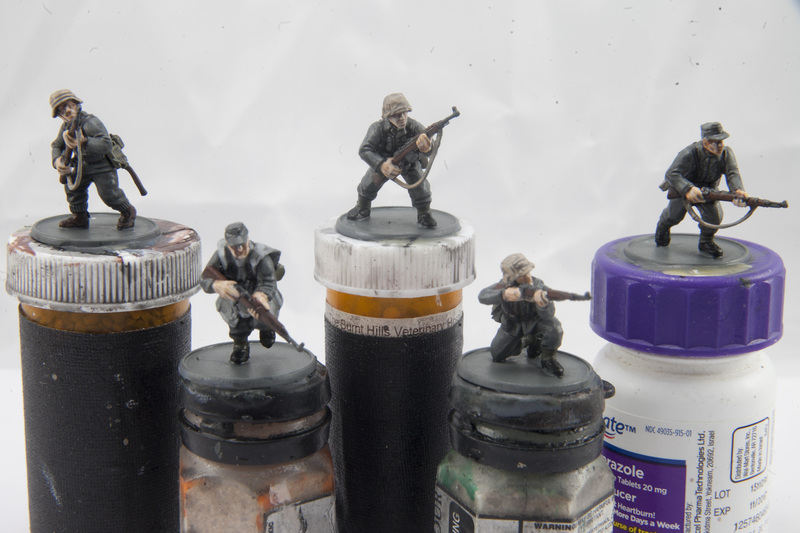 I also made some progress on some minis last week that I’m hoping to finish this week. Murph’s first army was an LRDG/8th army combo and I have had some of Perry’s plastics sitting around in various stages of completion for awhile now. These are ready for a wash and then highlight. 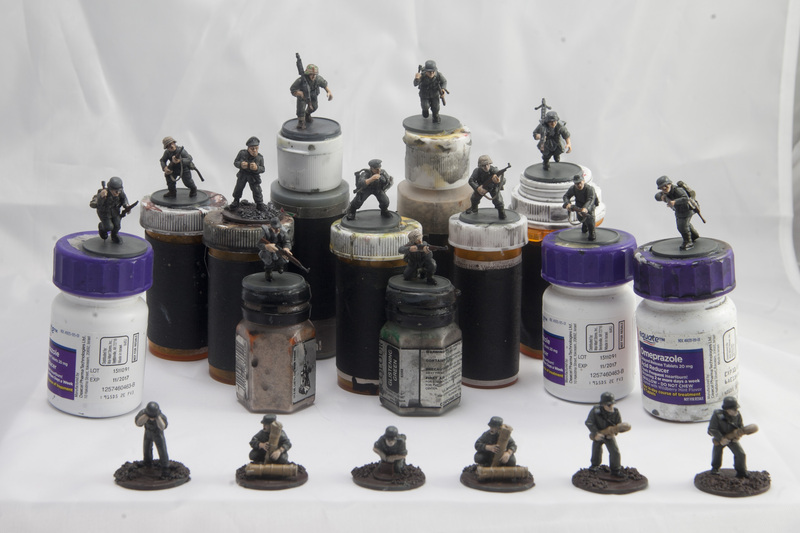 during one of my Black Tree Design binges I got a couple of packs of their ‘Airborne’ .30 cal teams. They’re wearing spats/gaiters so they’re clearly not Airborne, not that I’m a rivet counter. 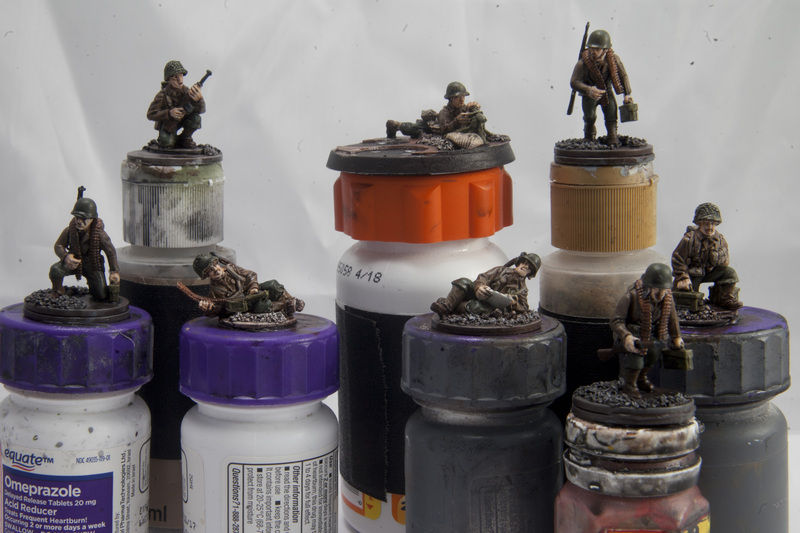 So they got put aside since I was rushing to finish some Airborne for a convention scenario I needed to get done. 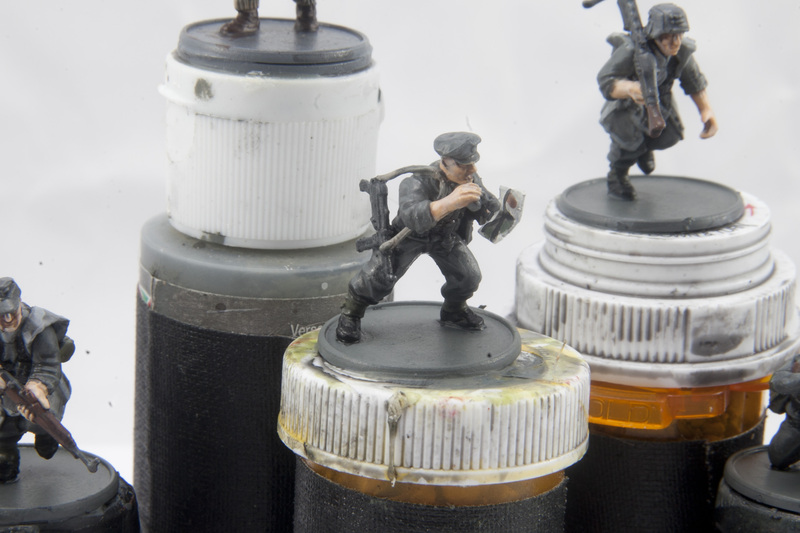 I’m generally pleased with Black Tree’s minis, being well worth the price even if the Fallschirmjager’s weapons are comically large. But I think theses need new molds. The detail is all soft and rounded and not up to their usual standards. I know that they have taken minis off of the store to redo the molds and these should be next on the list. Of course clearing minis off of the table means getting more ready to go on! Some great painting there Nate! I agree about the BT mmg team. They remind me of some of the old Airfix figures. 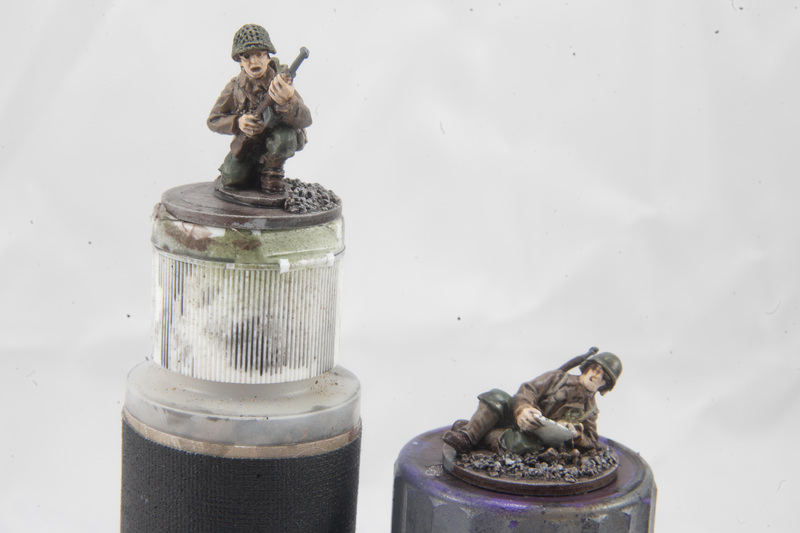 Next Next post: Airborne: The Battle of Carentan review.